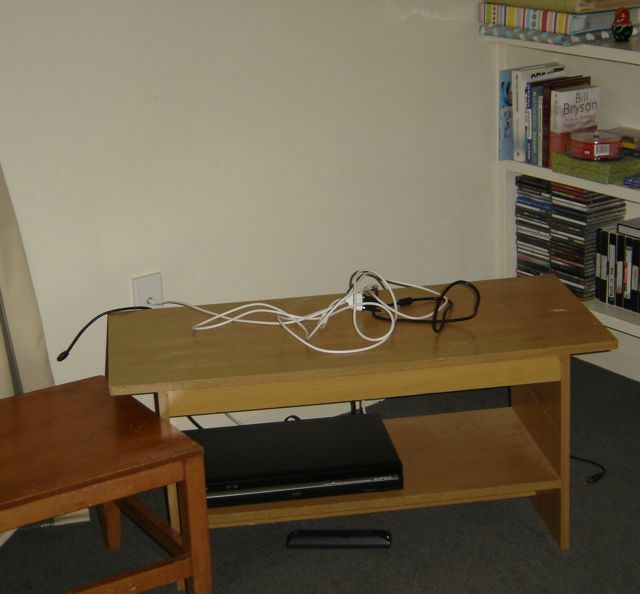 Our TV and Nintendo Wii have been stolen. Besides the matching controllers, remotes and cabling that is all the took on purpose, they (singular/plural) also lucked into taking the game in the machine. Very luckily the choose not to take the MacBook or the HDD recorder (as seen in picture) so our TV programs are still getting recorded YIPPY! I feeling so bothered by it all (ring the police and insurance) that I just want to relax by blobbing out in front of the TV, but I can’t. Or play some games, but again I can’t. So instead I’ll blog, which happens to be something I’ve not done is ages. I’ve started to feel really bad about that. In Zelda Wind Walker, I have gotten all the way to the final boss fight, but could never kill him because the stupid interact with Zelda to win tactic is not my style and she just keep hit me, so I’d die even faster, even though I had 4 fairies and 15 hearts. Argg. In Need for Speed Carbon, I am stuck with the tier three dude (one stopwatch race won), but can’t win a tier 3 car, and therefore lose all the challenge races as the PC cars are all beefed up now. So had only just restarted on Sunday. I’ve been reading a lot. I discovered the TradeMe can email the new listings each day for areas you’re interested in. So I’ve enough new books that Michaela has put a trade embargo in-place. But still TradeMe emails me each day, but most people are asking too much for newish books, or are trying to fob off old Visual Basic 3 type books. I’ve not blogged about any work stuff because well it’s all fire fighting, very work spefics or just plan boring, like ports our 12 year C/C++ code base from ANSI Win32 to Unicode WinCE with std::wstring instead of _TCHAR everywhere. What with doing the above mentioned porting work at home, and reading those books, I’ve not really done anything. This last fact is the most depressing thing really. Reminder: note down the model, purchase dates, and serial numbers of all your >$100 electronic devices…. with no tv, its a good time to go geocaching…. Really sorry to hear about your stuff being nicked. B*****ds. I’m sure you’re feeling pretty angry about it all. Thank goodness they didn’t steal anything else or trash the place. Hope you get it all sorted asap. Cheers Matt, it’s better than it could have been, but still highly interrupting. Hmm, gun dreams, I had a few of those, but alas, NZ law is so in favor of the criminal, that if I shot them or actually hurt them I’d get done for my crime over their crime of being in my house. But we did go away for a few holiday anyway, as that was preplanned….